Our in-house dental laboratory offers patients many important benefits. When restorations that are typically shipped to outside facilities are crafted on-site, patients can receive their crowns, bridges, or dentures much sooner. 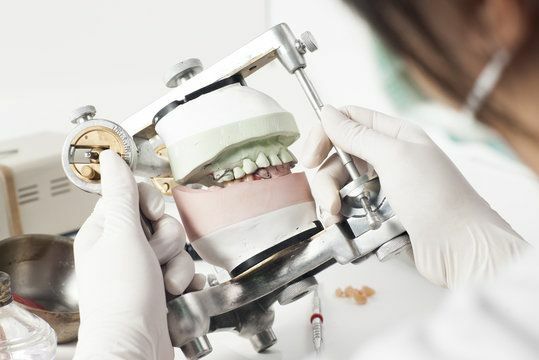 Meanwhile, a higher degree of control over the production process ensures that your customized restorations are created or repaired with the utmost precision, accuracy, and efficiency. With the only in-office dental laboratory in Vero Beach, FL, Dr. Robert Astles offers patients comprehensive and convenient care. To learn more about how an in-house dental laboratory can expedite your treatment, contact us today. The process of creating a restoration can be broken down into a few simple steps. First, your dentist takes impressions of your teeth with either a physical mold or a digital scan. Together with supplementary photos and detailed instructions about the specifics of your treatment, these impressions will guide a technician in crafting a restoration that is customized for your smile. Once finished, the restoration can be placed, and your dentist can make any necessary adjustments. With an off-site laboratory, this entire process can take several weeks. Our laboratory makes this process much more efficient. With 25 years of experience creating dental prosthetics, we can personalize each restoration, precisely matching the color, shape, and fit to an individual’s smile. There are many advantages in having an on-site dental laboratory. We can create a wide range of restorations, including veneers, crowns, and bridges. Because each restoration is crafted in-house, there is a high degree of quality control over each product. Our goal is to consistently and precisely produce high-quality restorations to ensure that you receive the best value for your investment. Each restoration is personally crafted by a certified dental technician. With 25 years of experience in creating dental prosthetics, we can personalize each restoration, precisely matching the color, shape, and fit to an individual’s smile. Because our technician can meet with the patient and evaluate the best aesthetic approach in person, we are better able to ensure a custom design that blends in seamlessly with your smile. The result is a restoration that looks and feels like your own teeth. With this high-quality product comes greater patient convenience. With every dental practice that uses an off-site laboratory for their restorations, treatment is put on hold while dentists forward the order and then wait for the final product to ship back to the office. But with an in-house dental lab, patient waiting times are greatly reduced. Patients can come in to have impressions taken of their teeth, and receive their new restorations much sooner. In some cases, we can provide restorations within a single visit. A damaged crown or bridge can affect your ability to speak and eat normally. Waiting two weeks or more for repairs can be a major inconvenience. The high-quality repair service performed in our in-office lab eliminates this issue altogether by repairing chipped, cracked, or broken restorations within a single visit. Dr. Astles and our team understand that you value consistent, high-quality care, and we offer the most practical solutions when it comes to restoring a compromised smile. To learn more about our laboratory services, reach out to us today.